Steven Meloney (left) plays the guitar as Woodstock High School seniors in band and choir (from left:) Andrew Gippert, Alyssa Gibson, Olivia Berg, and Molly Griffin sing unique song lyrics they created as they prepare to record their own song during an educational music experience inside the John Lennon Educational Tour bus at Woodstock High School on Monday, April 2, 2018 in Woodstock. 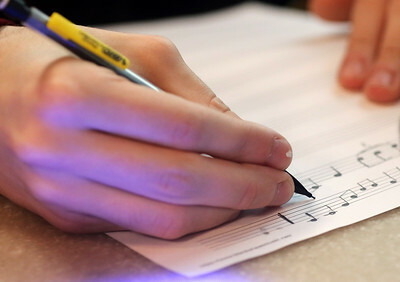 The bus travels the country to inspire and help teach kids more about the music industry. 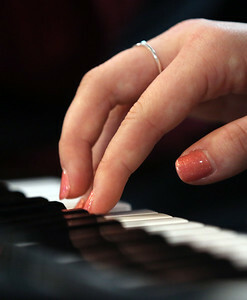 Woodstock High School senior Alyssa Gibson plays a song on the keyboard during an educational music experience inside the John Lennon Educational Tour bus at Woodstock High School on Monday, April 2, 2018 in Woodstock. The bus travels the country to inspire and help teach kids more about the music industry. 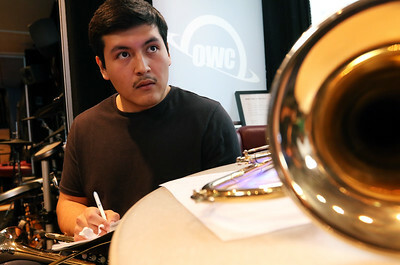 Woodstock High School senior band member Miguel Alvarez listens to his colleagues as he creates a trumpet solo on paper during an educational music experience inside the John Lennon Educational Tour bus at Woodstock High School on Monday, April 2, 2018 in Woodstock. The bus travels the country to inspire and help teach kids more about the music industry. Woodstock High School band and choir students are seen on video feeds for editing software during an educational music experience inside the John Lennon Educational Tour bus at Woodstock High School on Monday, April 2, 2018 in Woodstock. The bus travels the country to inspire and help teach kids more about the music industry. Woodstock High School senior band and choir member Franco Maltese writes musical notes for a saxophone solo as he and other seniors participate in an educational music experience inside the John Lennon Educational Tour bus at Woodstock High School on Monday, April 2, 2018 in Woodstock. The bus travels the country to inspire and help teach kids more about the music industry. Woodstock High School senior Alyssa Gibson smiles at her instructors as she and other seniors in band and choir participate in an educational music experience inside the John Lennon Educational Tour bus at Woodstock High School on Monday, April 2, 2018 in Woodstock. The bus travels the country to inspire and help teach kids more about the music industry. 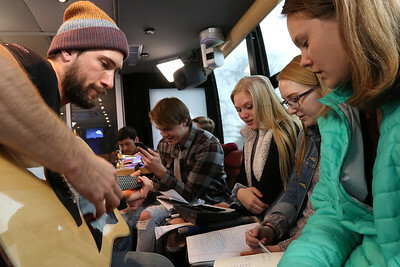 Steven Meloney (left) plays the guitar as Woodstock High School seniors in band and choir (from left:) Miguel Alvarez, Andrew Gippert, Franco Maltese, Alyssa Gibson, Olivia Berg, and Molly Griffin work on creating a unique song of their own during an educational music experience inside the John Lennon Educational Tour bus at Woodstock High School on Monday, April 2, 2018 in Woodstock. The bus travels the country to inspire and help teach kids more about the music industry. Woodstock High School senior band and choir member Franco Maltese replaces the reed in his alto saxophone as he and other seniors participate in an educational music experience inside the John Lennon Educational Tour bus at Woodstock High School on Monday, April 2, 2018 in Woodstock. The bus travels the country to inspire and help teach kids more about the music industry.